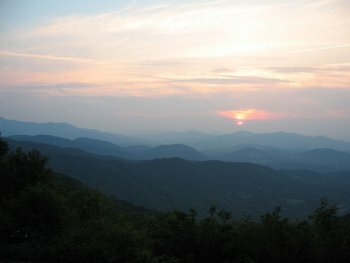 Looking at how the Blue Ridge Parkway showcases the Little Switzerland peaks, you would think that it was always a “natural” for being located here. Knowing the affection that Little Switzerland residents now hold for the Parkway, you would also think that it was well loved from the beginning. The Parkway almost didn’t come to Little Switzerland at all. With the route caught in a battle between North Carolina and Tennessee, there was a strong chance that Parkway would cross over to Tennessee starting around Linville, and pass Roan Mountain, Unicoi and Gatlinburg on its way to the Smokies, leaving no parkway through Little Switzerland. This route was recommended by the committee (chaired by Senator George Radcliffe of Maryland) charged with planning the Parkway. The Radcliffe committee recommendation was without a doubt the politically ideal route, giving substantial shares of the route to Tennessee as well as North Carolina and Virginia. Stunned by the Radcliffe committee recommendation, advocates for a North Carolina route south of Linville launched an intensive and successful lobbying effort. The most vocal of the advocates was the Asheville business community. Less visible but perhaps equally influential was the support from Josephus Daniels, then ambassador to Mexico and closely connected to the Roosevelt administration in Washington. When the battle for the route was over and North Carolina selected for the route south of Linville, the Parkway was not exactly greeted with open arms in Little Switzerland. Many seasonal residents had chosen Little Switzerland as a quiet and secluded retreat from the noise of Piedmont and low country cities, and were dismayed by the prospect of a mountain top highway “slashing though” the community. Little Switzerland’s founder Herriot Clarkson, initially a supporter of a parkway near or even through his community, was alarmed by the amount of land required for the road and its scenic easement, as well as by the absence of connections between the Parkway and community. Hiring a team of eight lawyers, Clarkson demanded and won a land price ($575 per acre) almost ten times the average being paid along the Parkway. Doubtlessly attuned to the court decision on land price (it reached the NC Supreme Court), the Highway Commission, at that point in charge of Parkway design on behalf of the National Park Service (NPS), made two of the most important concessions on design on the entire Parkway in North Carolina: an interchange centered on the site of the Switzerland Inn and a narrow right of way devoid of the protective scenic easement carried by almost all of the rest of the mileage in North Carolina. The Little Switzerland tunnel, a signature of the community, was not part of the original plan. Instead, that plan called for a Parkway to skirt the north side of Blands Knob, resulting in a pair of what would have been the tightest curves along the Parkway. Typical of the road design process, reasons for the change to the tunnel are not well documented. It is possible that, given the battle over land value, the NPS decided that it would be simply less costly, in dollars or agitation, to tunnel rather than buy more right of way with a compromised buffer. Driving on the Parkway today, serene and much loved through Little Switzerland, it’s hard to imagine that it almost didn’t come at all, and that it wasn’t always a welcomed feature.